This discussion was created from comments split from: Super Heroes 2014. 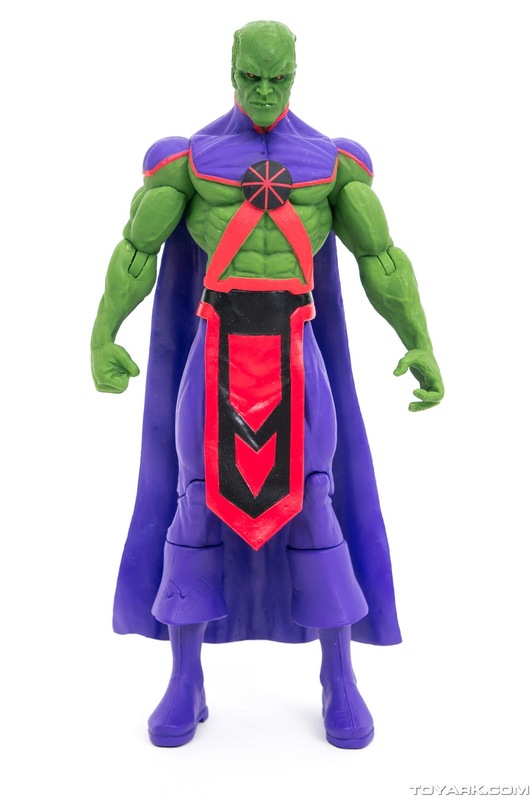 The Martian Manhunter is coming in March! Cool!! But, but, but.... where is our Green Lantern?! ^^ what a cute fig! Fantastic! I would not have expected to see a Martian Manhunter in sets any time in the next few years just because he's not nearly as well-known as a lot of "costumed" superheroes like Superman, Batman, Flash, Aquaman, and even Green Lantern. He might have shown up as a Comic-Con fig because those have occasionally been more obscure characters or costumes that you need a bit of "nerd cred" to be familiar with, but a GWP polybag is even better because it means wider availability. I definitely agree, Green Lantern is now the main Justice League character in need of a wider release (preferably in a non-movie-inspired version of his costume like the others). No idea when or how that might come about. 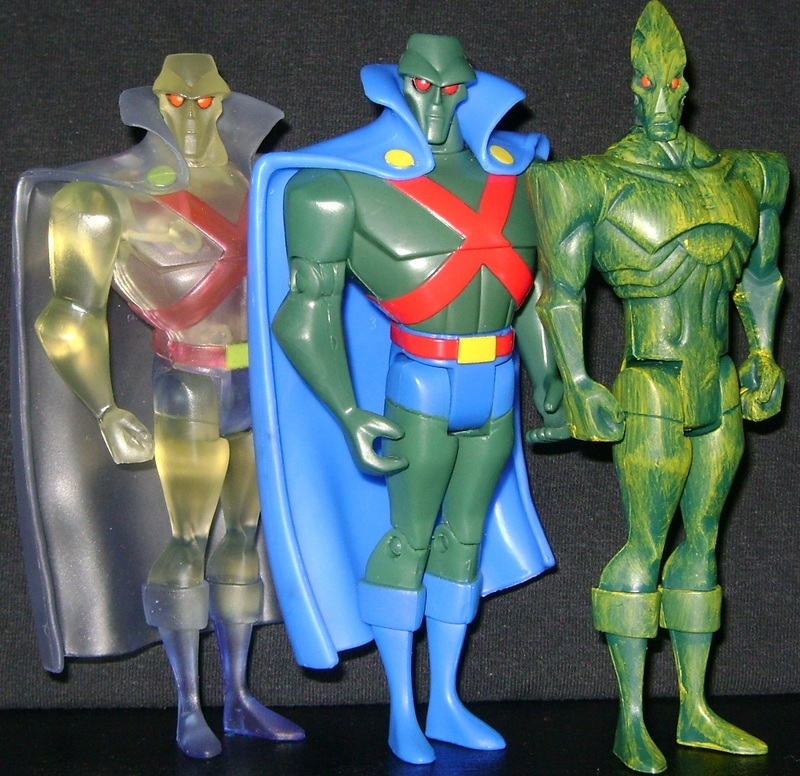 I know the disappointment from the Green Lantern movie put a damper on toy manufacturers' desire to produce toys for retail sale based on that character, but since the LEGO Group has gone ahead and made figures for regular release of such characters as Aquaman and now Martian Manhunter, I have no doubt in my mind that completing the original Justice League is a goal they have, whether an immediate or eventual one. Any Justice League fans able to shed some light on what depiction this particular version of his costume ultimately comes from? I am very excited to get my hands on that Minifigure, a great addition to the growing Justice League. Cyborg and Green Lantern are now the only two I am really desperate for. 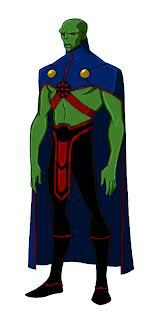 Martian Manhunter?!?! Good one TLG! It's been a Good Friday that just keeps getting better. CRAP!!! I was just setting my budget for February.... Where's that money tree?!?!?! Now I have to spend, spend and spend some more to get this. Well hope the kid's good grades keep coming. Now that's a freebie I can get behind. I would never have expected this! Brilliant! Wow...sooo unexpected and so great. 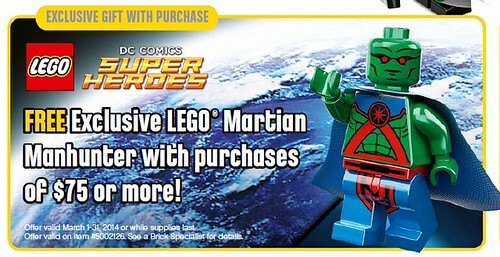 Like someone said above, this screams SDCC more than store freebie so kudos Lego!!!! Wow, that is out of the blue! Fantastic, cannot wait. Loving the Super Heroes line! March is often double VIP. Extra sweet. Looks like new 52 to me, too. Here are some images: to me it looks like it is based on the new DC52/ Injustice Gods game figures (first 2 images) not on the JLU figure in 3rd/4th images. I wish they had made or make the JLU version and the clear/transparent version would be great too. That is completely awesome. We should see new DC and Marvel Superhero sets around that time as well, and if we get double VIP points? How can you go wrong? I can't wait! I want it now! Here's hoping. But wouldn't it be on the calendar? It has been double VIP the last few years, but not this year it seems. I was hoping to make a dent in my exclusives wanted list in March with the double VIP but I can't hold out much longer. 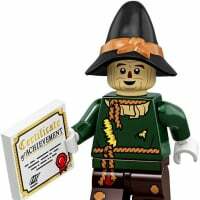 Since nearly all of Lego's in store promotions also apply online; to ensure all customers get fair access to perks, I'm sure you will be able to reeve this GWP when you spend over $75 online! Stupid question time as I normally don't pay too much attention to these sort of things - BUT IT'S MARTIAN MANHUNTER! Will this offer also be available in the UK? Isn't it May that's usually Double VIP points? Drat....no major purchasing for me for awhile. Sadly I'll have to miss out on Martian Man Hunter...which is a shame because I'd love to have all the big seven justice leaguers. Hey now, it is easy to come up with an excuse. Buy future birthday gifts for any and everyone you can think of. Christmas even. 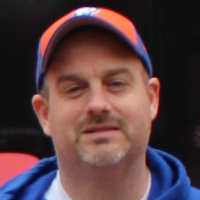 Buy something as tradebait then list it here. Buy something for FairyBricks. Buy something just because it is Lego! You will regret it 6 months later when the only way to get one is paying through the nose for it on eBay/BL/BO. - Guy who wanted a VW van poly but didn't get one and is not willing to pay $30 for one. Wow that's out of the blue. 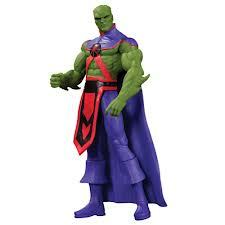 I know nothing about Martian Manhunter but he looks brilliant and will be a great addition to the Superhero figs. I will definitely be waiting for this to get any of the new Marvel/DC sets. For me personally, any set that I have bought to "bring me over" the threshold on [email protected] to get free shipping or the free poly. I look afterwards and kick myself for not just paying for shipping or getting the poly on BL or something similar. Also, any set that is outside of the core themes I am committed too; once in a while I just want to splurge and get something new, but I always end up regretting it! You should be able to find them on ebay by Mid-March in the $10-15 range. Possibly even less. Just make sure you look for them while the promotion is still going. hmm no chance the new Super Heroes sets come out in March? 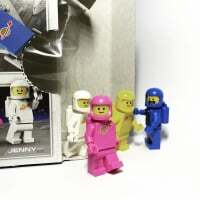 would make sense to offer a minifig when they are actually released lol. I got excited when I saw the listings already on TRU. My daughter has been wanting the Cinderella castle set so I could hold off on that till march I suppose. I believe the two new DC sets will be released in March, because they are shown on the (US) calendar. In fact, the Steamroller is the main image above the calendar. @veign06 #76017 Capt America and #76018 Hulk release in March. I originally posted something along lines of it being odd that they'd choose to release this character as a promo without the associated 'poster boy' Green Lantern - I was mistakenly thinking this guy is part of the wider green lantern stories - which could've meant people might not bother with the promo if there's no green lantern... and then if they did do green lantern set(s) later, some people might pass on those, if having missed the promo team member. ... but then i googled and found this guy isn't a 'green lantern' side-character as such, but part of the justice league. So i retracted my comment, leaving I don't know my comics. Well, I'll be getting at him!! Now I just need GREEN LANTERN!!!! Yep. Just called CS. Martian Manhunters are GONE! ^ That's why its a good idea to order as soon as possible. That was fast! It's still pretty early in the month too. The Minifigure still gets added to my cart when I checkout.